Given Leenaun's location nestled between the Maamturk, Partry, Ben Gorm, Sheefry, Twelve Ben and Mweelrea ranges, it is no surprise that it's namesake hill boasts great views. On a good day, views in all directions are spectacular. 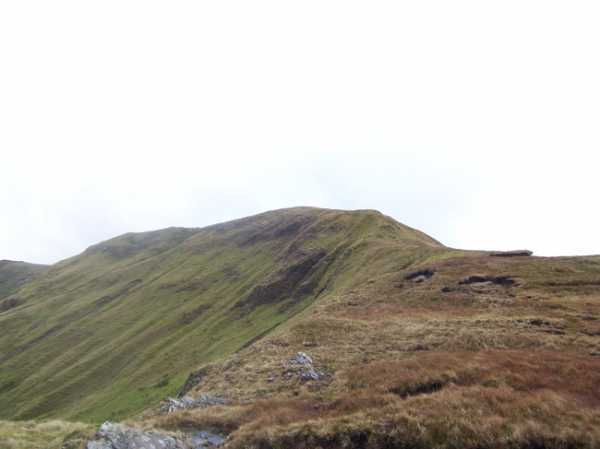 Leenaun Hill is a well climbed hill and easily reached from a number of directions. Perhaps the easiest route for an out and back walk, is from L88170 61411 A, on the R366, where there is a gate and a track. Starting from here means an out and back distance of c.6k and 1.5 hours. There are also a number of potential starting points along the N59. There is room to park one car at L85017 62467 B, and several more at L856 624 C and L870 620 D, where the Western Way leaves the road. Access is also possible from a shared entrance at L87370 61831 E This grid reference in the text is shown as point E on the Detail Map above'>L87370 61831 E E.